Update: Senate President Tito signs the P3.767 trillion General Appropriations Bill for 2019 “with strong reservations.” The enrolled bill will now be transmitted to the Office of the President for review and signing. You might observe that the government prioritizes education and public works. The Budget for Education shall always be the biggest funds in every budget passed by the congress of the Philippines. This is in obedience to the provision of the Philippine constitution which provides that the state shall give priority to education to foster patriotism, nationalism, accelerate social progress and promote total human liberation and development. This does not mean that the government is not free to balance the demands of education against other competing and urgent demands like say defense. 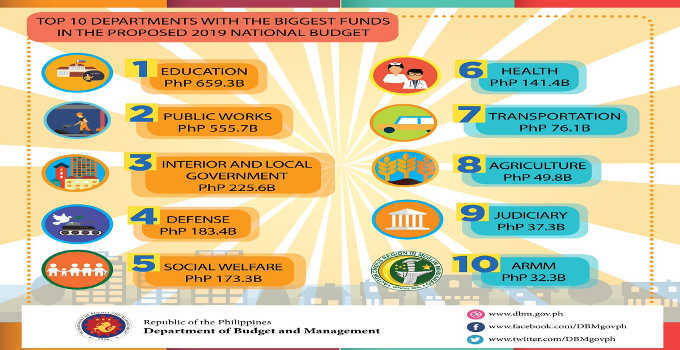 The Budget for education, consisted of the budgets of the Department of Education (DepEd), State Universities and Colleges (SUCs), the Commission on Higher Education (CHED), and the Technical Education and Skills Development Authority (TESDA). Its cash-appropriations in the proposed 2019 budget amounts to P659.3 billion, higher by P72.2 billion or 12.3% than its cash-based equivalent in the 2018 budget. The proposed 2019 budget, the third budget of the Duterte Administration, is set to be submitted to Congress on July 23, the day President Rodrigo R. Duterte delivers his third State of the Nation Address (SONA). The P 3.757 trillion national budget will be the first cash-based budget of the government, reflecting the urgent need to speed up public service delivery to the people. what is the status of the 2019 National Budget? Who are the 13 Martyrs of Cavite?